Make exquisite casts of impressions, bite marks, tool marks, even lift powdered prints from textured surfaces. This highly sensitive, non-toxic, silicone-based material comes pre-loaded in dual-stage cartridges for immediate use. Save time, because there is no need to mix two solutions. Conveniently, this two-part casting material mixes inside the tip of the ForenSil gun once the trigger is squeezed. This efficient method of dispensing eliminates any mixing errors or messy clean-up. Leave the extruder tip on after you are finished to preserve the remaining Forensic Sil in the tube for use later. ForenSil cures in just 4-6 minutes and has almost no shrinkage. The kit includes a 50 mL cartridge of light viscosity ForenSil for horizontal surfaces, a 50 mL cartridge of medium viscosity ForenSil for vertical surfaces, a ForenSil Applicator Gun, 12 mixing tips, and a sturdy plastic carrying case. 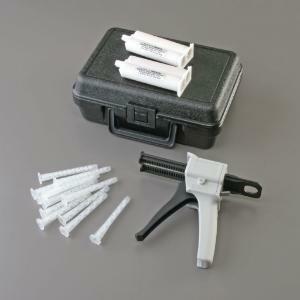 Ordering information: The kit includes a 50 mL cartridge of light viscosity ForenSil for horizontal surfaces, a 50 mL cartridge of medium viscosity ForenSil for vertical surfaces, a ForenSil Applicator Gun, 12 mixing tips, and a sturdy plastic carrying case.